After a bit of a disappointing July weather-wise, August is finally here and the sun is out for what feels like the first time in a long time. All this vitamin D and serotonin has gone straight to our heads and put us in a right good mood! As a consequence of this, we've only gone and knocked 30% off our Sunflower Surprise Bouquet! An explosion of wholesome summery goodness, the Clare Florist Sunflower Surprise perfectly captures the warmth and optimism of a gorgeous summer's day. The sunflowers in this arrangement are beautifully complemented by green foliage and red berries for a wonderfully naturalistic feel. Whether you want to send sunflowers as a gift or you are looking for a way to decorate your own home and brighten your surroundings, this unique arrangement will do the job nicely. 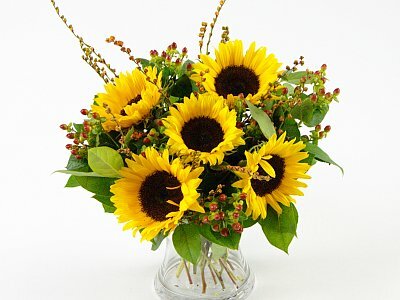 The quintessential summer flower, sunflowers have a rich history in floristry, art, poetry and culture at large. The subject of a poem by Allen Ginsberg and numerous iconic paintings by Van Gogh, the sunflower has come to be interminably connected to feelings of joy and happiness.